Orthodox Church liturgical Greek Priest vestments (yellow-gold with claret) by Istok Church Supplies Corp.
Istok Church Supplies offers an extensive range of handcrafted Greek Priest vestments in yellow gold and claret in the traditional Orthodox Christian style, with highest degree of attention to detail and workmanship. Through our work, we aim to assist Greek Orthodox Priests in carrying out their sacred ecclesiastical duties. 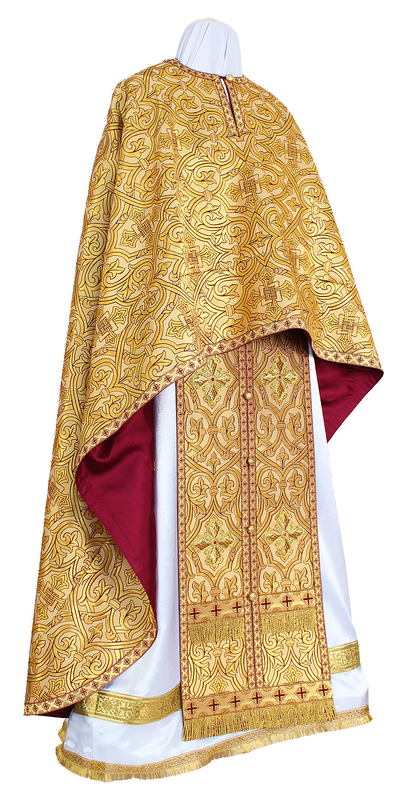 Our Greek Priest vestments in yellow gold and claret look magnificent and feel wonderful. We offer them as basic sets and each individual set contains five items – phelonion, epigonation, zone, epimanika and epitralhilion. Customers can choose vestments made from either metallic jacquard brocade or rayon jacquard brocade. Our fabrics feature attractive patterns and motifs and customers who wish to purchase a particular vestment with a different fabric belonging to the same class can do so by making a note in their order. We provide natural rayon lining for all our Greek Priest vestments. Up gradation options for our resplendent Greek Priest vestments in yellow gold and claret include natural velvet inserts, matching chalice covers, matching podriznik and an embroidered icon from given list of options. We provide three types of adornments – standard, premier and luxury. Customers can choose the style depending upon their budget, church requirements and taste preferences. For standard type, we provide plain crosses and inexpensive trimmings. For premier type, we include embroidered crosses and high quality trimmings. For luxury type, we offer solid jacquard trimmings and richly embroidered crosses. The Greek Priest vestments we offer weigh around three and a half kilos and are designed to last a long time. They are made in accordance with centuries old Orthodox Christian canons. We accept custom orders for Greek Priest vestments but require a few weeks for their careful construction and delivery. We invite you to send in your accurate measurements as per our online measurement chart so our expert tailors in Europe can construct perfectly fitting vestments with impeccable stitching. We accept international orders. Take advantage of our superior online shopping experience and get custom Greek Priest vestments delivered to your doorstep!